Course plan courtesy of Captain Dawn Brooks, Santa Barbara Channel Swimming Association. Dan Simonelli always helps crew for others, from high school students crossing the Catalina Channel to solo swims across the English Channel. But today and tonight and tomorrow is his time. 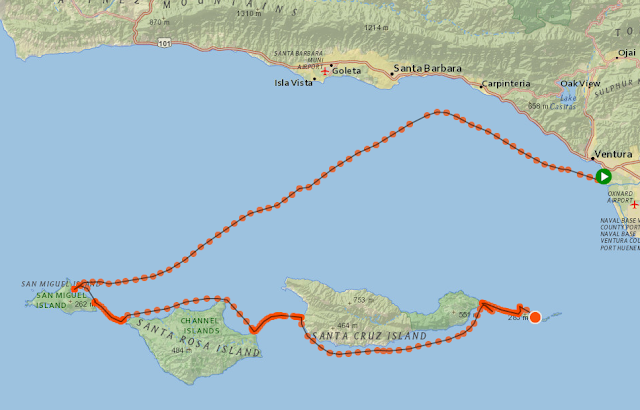 Simonelli, founder of the Open Water Swim Academy in San Diego, created a unique Island Hopper stage swim around the Channel Islands of California. "I feel good, but the unknowns keep me guessing," he said before departing from the mainland [see route below courtesy of the Marathon Swimmers Federation TRACK RS system]. Simonelli, a daily dipper in La Jolla Cove, should be acclimated enough to handle the water temperatures, but it is the currents that are likely to be the most difficult factor he will face in the island-to-island swim. "The tricky part will be balancing nutrition between the swims - and the mental game of getting in and out of the water," he explains. 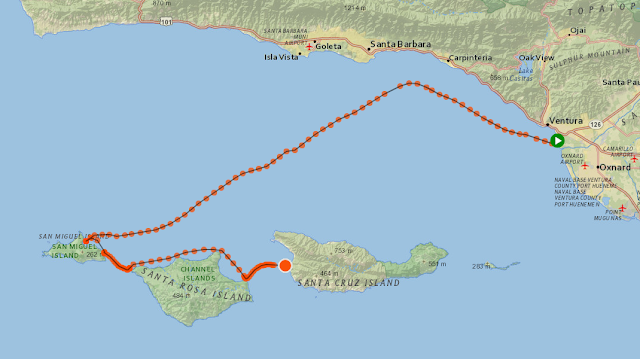 "Normally, you think you are done after a long swim so getting back in the Pacific for each swim will be an interesting challenge - especially for the last and longest Anacapa crossing." Officially, Simonelli's adventure is four separate and distinct swims called the Santa Barbara Island Hopper where he will start in San Miguel Island, then head to Santa Rosa Island, then onto Santa Cruz Island, then onto Anacapa Island and then into Silver Strand Beach in Oxnard on the California mainland. 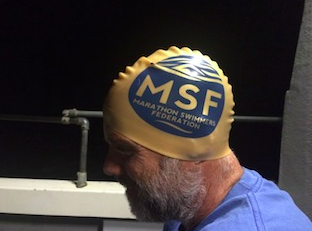 "I will finish one interisland swim, boat around to the next starting point, jump in and go. I expect to have enough rest and warm-up time during each transport [between swims]. The swim is estimated to take 24-30 hours."